Roasting garlic may be time consuming but it is well worth the extraordinary added flavor. 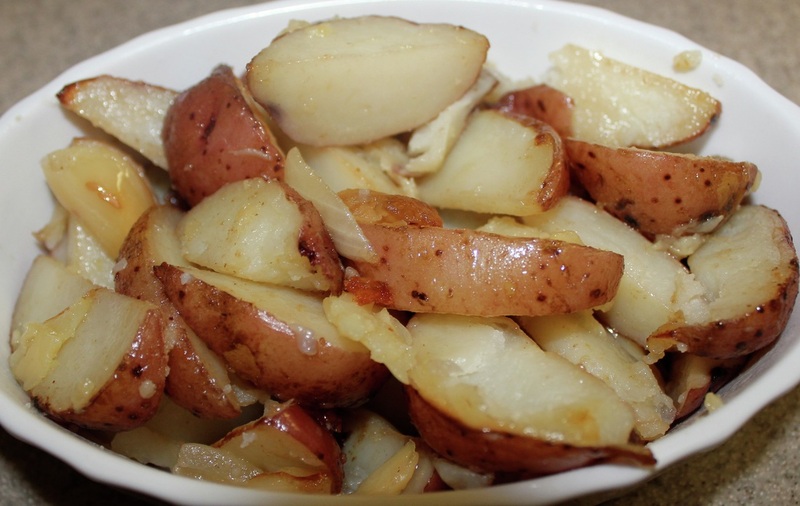 It gives these Roasted Garlic Potatoes such tremendous flavor. Pre-heat oven to 350 degrees. Cut the top off the garlic bulb, remove most of the papery skin, and rub the garlic with oil. Cook garlic for 50 minutes in a garlic roaster or wrapped in foil. Remove garlic from oven and let cool. Coat potatoes with oil and vinegar. Place potatoes and onions in baking dish coated with cooking spray. When garlic has 30 minutes left place potato and onion mixture in the oven. Stir 2-3 times over the 30 minutes. When potatoes are tender remove them and the garlic from the oven. Press the roasted garlic from the bulb onto the potatoes and onions, mix well before serving.